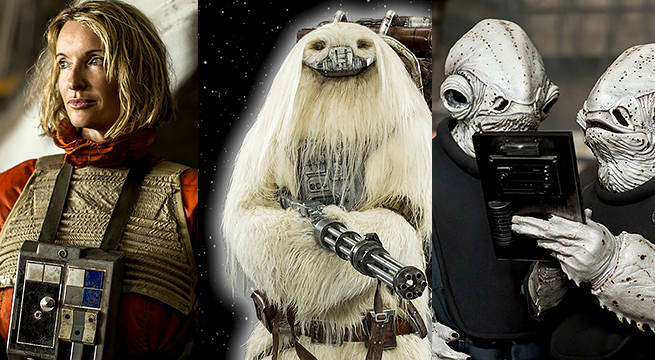 The world of Rogue One: A Star Wars Story continues to expand with new looks at characters, revealing some brand new ones, and showing off closer looks at some that have quickly become fan favorites. The images come courtesy of the Topps Star Wars Card Trader app, and debuted on EW.com. A female X-wing pilot stands proud on the first card, with a unique cloth wrap on her uniform. The blonde pilot could be the Alderaanian Evaan Verlaine from the Princess Leia comic book published by Marvel Comics, but that hasn't been confirmed just yet. With at least 80 kills noted by her helmet stickers, she's an accomplished fighter. There were originally X-wing and Y-wing female pilots in the Original Trilogy of Star Wars that were lost to the cutting room floor, but the comics, novels and recent films have been exploring the female fighters of the Rebellion more. Another Rebel in a pilot helmet is revealed as General Merrick; while he's a military leader in the Rebel Alliance, Merrick does pilot (and has been seen in the footage from Star Wars Celebration Europe) ships himself actively as well. New creatures and aliens are a staple of a new Star Wars film, and the fuzzy white-haired Moroff and creepy tubed-up "Two Tube Twins" both fit that bill. These mercenaries all work for the highest bidder, and all use special breathing apparati to survive in human-centric atmospheres. New whitish-shelled Mon Calamari are in another image, seen with Rebel Alliance soldiers. This isn't the first time we've seen non-red residents of Mon Cala, though - in Star Wars: The Clone Wars we saw several new shades to their looks, including orange, purple, and a brighter blue. Finally there's an image of "Life on Jedha" with three beings in mysterious full-body wraps. The helmets they wear, covering their full faces, do bear a slight resemblance to the helmets that Jedi Temple guards have been seen wearing in both The Clone Wars and Star Wars Rebels animated series. The pilgrimage to Jedha is a sacred one for those who worship and believe in the Force, so these characters represent that. Take a look at the full gallery below for the full-size images, and start your own speculation about how all these characters will play a role in Rogue One: A Star Wars Story when it hits theaters December 16, 2016.